Dress up your angel in this red colored suit set with a blue embroidered jacket from Ahaarya and let her be the showstopper at an upcoming family wedding or festival celebration. This is a 3 pc readymade set and comes with anarkali style Kameez, churidar and dupatta. Available for girls aged 4 year old thru teens. Size 24 will fit Ages 4-5, Size 26 will fit Ages 5-6, 28 will fit Ages 6-7, 30 will fit Ages 7-8, 32 will fit Ages 8-9, 34 will fit ages 10-11, 36 will fit Ages 12-13, 38 will fit Ages 13-14 and Size 40 will fit ages 15-16. 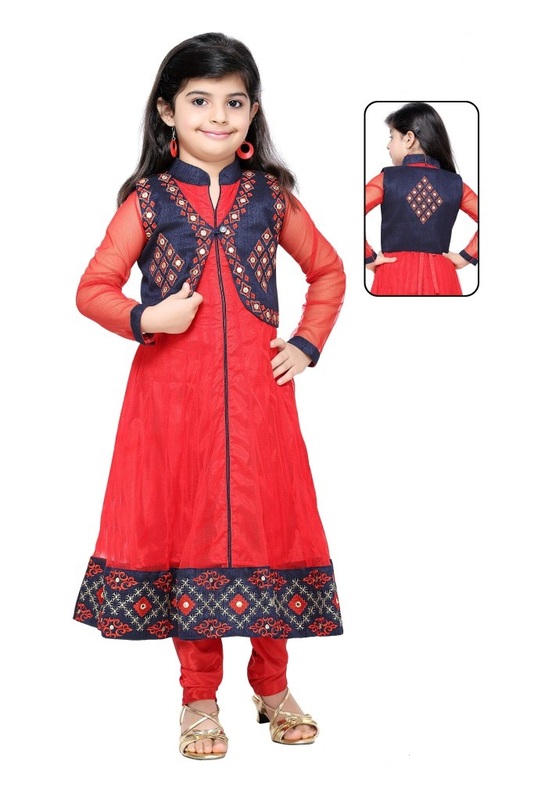 This item in Salwar Kameez for Kids category was first added to our catalog on 10-27-2015. Buy Ahaarya Girls Red Jacket style Anarkali Suit, sold & shipped by Ahaarya where you can shop online for Latest Fashion Indian Dresses, Sarees, Salwar Kameez, Kurtis. 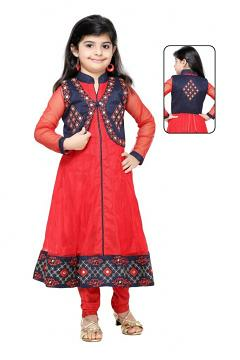 This Salwar Kameez collection has been tagged as Readymade Kids Wear, Anarkali Suit, Traditional Indian Clothing.